A while back I hosted a mini online AAC/AT tour of Japan which showed a KidStation Playstation controller by Bandai being used with Joy-to-Key software to operate a computer. This inspired my blogger pal Barrie of One Switch to purchase a used KidStation, rehab it and offer it for sale (including a Playstation to USB adaptor and a disk with Joy-to-Key) in his online shop. The moment I saw Barrie's post I wanted the KidStation, so I bought it from him (thanks for the deal Barrie). My idea for it was simple. I wanted to allow one of my students, a music lover who has extremely low vision with some motor and learning difficulties to control iTunes on our classroom computer. Using Joy-to-Key (which is always available free from One Switch) you can reassign the buttons on any gaming controller or joystick to be what ever you need them to be. The software is pre-set with a few configurations, such as mouse emulation, but to make the KidStation run a media player I had to assign the buttons myself. Once I sat down at the classroom computer I realized Windows Media Player would be the best choice (mostly because it was already on the computer and iTunes wasn't). So I assigned the left button to go back to the last song (ctrl-b), the right button to go to the next song (ctrl-n), the bottom button to pause/play (ctrl-p) and the top button to toggle the visualizer. Next I used sticky-back craft foam to make the markings on the buttons tactile so my student with visual impairment can distinguish them. Finally I let my learners at it. A different student than the one I originally planned on using the controller tried it first, from her stander. She really enjoyed scanning through the songs by hitting the right button until she found one everyone liked (indicated by us starting to hum or sing along) and then changing the song as soon as we were into it. She really cracked herself up. A while later the student I intended the controller for tried it. It took him under ten minutes to figure out how to scan through the songs and listen for the ones he likes and then click the left button to replay it. The biggest surprise to me was one of my older students, who is not usually "into" activities like this really wanted to try it out. We didn't have time and there wasn't any music he would have liked on the computer anyways, so he will give it a whirl tomorrow. My older, usually not-into-technology student tried out the Kidstation with Windows Media Player today. He loved it! In fact, he tried it out the minute he arrived at school, used it until he had to go to his job in the community (Ben and Jerry's). When he came back from work, after lunch, he when right back onto the computer to use the Kidstation. He decided that he will bring in some country music CDs to download on Monday, since there is only one country song on the playlist and had someone write a note to his mom to remind her to send in the CDs. I think his favorite part of using the Kidstation was making it go to the song Mahna Mahna from the Muppet Show, because one of the staff really doesn't like that song. This student also has low vision and some motor and intellectual challenges. He is less likely to use the tactile adaptations and more likely to use location and color to find the button he needs, however. If I can get my hands on another Kidstation before his next birthday I would love to give it to him to use on his home computer. Today I went to a great workshop presented by Maureen Gates from Boston College. She showed us a fantastic piece of software, actually many pieces of software, CameraMouse and games for CameraMouse. CameraMouse is software that interprets any movement in front of an off the shelf webcam to mouse movements. Although it is generally used as a head mouse, it can be used with any body part that can move in four directions (up, down, left, right). CameraMouse can be used with even the slightest movement, so slight that when set to the "extreme" level just looking where you want to mouse to go moves your head enough to move the mouse. For users with extraneous movements it can be set to allow more freedom. 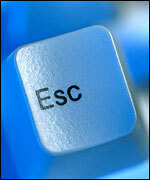 CameraMouse has a built in auto-click/dwell feature that eliminates the need for a switch or other method of clicking. You can also limit the window that CameraMouse moves around in so that the user doesn't accidentally close programs. All of these features are fully programmable. When working with CameraMouse you are given plenty of games to teach everything from cause and effect to grade level academics. There are even special internet browsers and an online gaming program that allows users to compete in various CameraMouse and/or Eagle Eyes games. CameraMouse is NOT available right this minute but BC will offer it free of charge (not just free for 30 days, free period) for download in about a month - keep checking here or there site for more info. So if you are about to spend anywhere from $180 for a TrackIR to $400 for QualiEYE (practically the same as CameraMouse - I tried both) to $8,000 for an ERICA or TOBII you might want to wait a month! I missed a few commercially available low-tech AAC Boards in my post last week, so here are a few more. The first is the Communicard Trio. It includes three pads of single sided communication boards, two picture and one spelling. It can be used in multiple health care settings and is disposable. It is mostly designed to be used as a short term solution while AAC is evaluated. It costs about $27.00 for the three pads of 50 sheets. The health care communication board by Greenhouse Publications is a full color, disposable, two-sided board. It includes a pain scale and common images to communicate health care needs on the front and a spelling board and more images on the back. A pack of fifty costs $14.00. 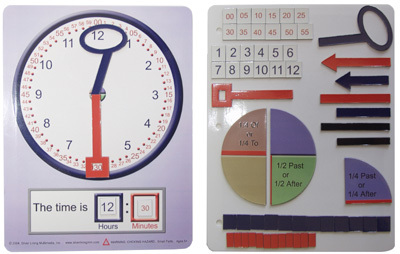 Also from Greenhouse Publications are the interactive communication board sets. There are four full color sets including recreation, leisure and community, home and health, food and sensory/social and emotional. The boards are printed on card stock and laminated for durability. Each set is about $30.00. Finally here is The Ring a set of 20 mini-communication boards held together on an "O" ring. TLWMSN will have no new posts during Memorial Day weekend so I can go camping. Since I have camping on the brain, today I provide you with links related to accessible camping. First of all I want to let you know that all U.S. Citizens with permanent disabilities, certified by a doctor, are entitled to an America the Beautiful Access Pass. This pass allows them and everyone in a car with them to get into U.S. National Parks for free. Although there are other ways to create a texture based schedule board, I am going to share with you how I did it for one student. This student was blind, had CP and moderate to severe cognitive challenges. The student needed a schedule board to help decrease behaviors around transitions and was capable of using abstract textures/tactile sensations to represent ideas like "physical therapy" or "pre-vocational activities". The student had previously been using texture symbols as a teaching aid to learn complex information and had enjoyed the process of choosing the textures to match certain items or concepts. I considered two different commercial textured products, because we had already used all of the textured items I could readily put my hands on for his other symbols. The commercial products I considered were Teachable Touchable Texture Squares by Super Duper, Inc. (above) and the Sensory Discrimination Kit by Enabling Devices (left). The Sensory Discrimination Kit provided eight 3x3 inch texture squares for $69.95 and the Teachable Touchable set gave me 2 each of ten different texture squares that were able the same size but soft puffy pillows instead of hard plastic squares and they came in a cloth carrying bag for $19.95. I went for the Teachable Touchables, especially since this was coming out of my pocket. Once the Teachable Touchables were delivered my student and I sat down and he assigned a different meaning to each of the textures (e.g. the net like one was PT and the corduroy one was OT) with some cues. We practiced matching the textures to the meanings for awhile and then I secured Velcro the backs of each texture. I already had an Enabling Devices Go! Board in the room that I was not using, so I decided that would work fine. However, if that were not available foam core board covered in clear contact paper would have been worked or even a strip of sanded, painted wood or, perhaps, taped and painted tri-wall. Go! Boards that do not talk with 2x2 inch squares run for about fifty dollars, the Talking Go! Board with the 3x3 inch squares is about $173.00. The foam board, wood or tri-wall is much cheaper. The Teachable Touchable squares fit fine on the 2x2 inch Go! Board. Now all that needs to be done is to arrange the texture symbols in order each morning and use the texture schedule board with the student the same way a sighted child would be guided to use a visual schedule. Need more information about Assistive Technology? Check out the AT Wiki. Know a lot about Assistive Technology? Add to the AT Wiki. I am sure by now you are all fans of the (free) Priory Woods Music Videos designed to be used with a switch and/or touch screen. I have one student in particular who loves them. He generally accesses the computer by using a touch window. He cannot visually locate target on the screen to use a touch window by looking at it, but he has memorized where on the screen to touch to make certain things happen in certain programs. I wanted to find a way for him to be able to choose which Priory Woods Music Video he sees/hears. I did this using Jim Luther's free special needs application Launcher 6. Launcher 6 is designed to be used by special needs students to more independently access a computer. It offers a choice of six on screen buttons each of which can launch a program or Priory Woods video. Launcher 6 blocks the student from getting in to things he or she should not (although I would still take the keyboard away, my student did manage to find his way in). Programming Launcher 6 is simple. You assign each square a program or video to open and then assign it a corresponding picture. In my case the pictures are more for my benefit, but my student can already find, by screen location, the Grease video and what he calls, "A bird! ", which is a touchscreen game with nature noises called Touch Circles. If you wish your student to have more than six programs or videos to launch you can link different launcher boards together. If using Priory Woods videos you will need to choose videos that are switch only, unless your student can navigate the selection method page using his or her selection method. You will also need to either set up another switch programmed to act as the "esc" button, which minimizes the videos allowing the student to get back to launcher (no need to close the video, just escape to minimize and touch/click on Launcher 6 in the background to bring it forward), or you will need to keep an eye out and periodically walk by and hit escape to minimize the videos. I strongly recommend headphones, unless you are more tolerant than I am of "the bird!" and the Grease song playing over and over and over and over... .
Launcher 6 will also scan for use with one or two switches and can be used with a mouse or mouse emulator, or intellikeys as well as the touchwindow. There are options to use recorded sounds, including recording a voice, to make it an audible scan, if needed. Comment or e-mail with questions. On Thursday the postman delivered Clicker 5 to my door. I spent a frustrating couple of evenings trying to figure out why everyone said it was so easy before I discovered a few online tutorials. The video ones at Kent School and Atomic Learning were particularly helpful. Crick Software, Call Centre and Kent School have nice print tutorials too. Once I got a hang of the basics making activities was easy. I even uploaded a unit on jobs for older learners with special needs and a few other activities to learninggrids.com. Learning Grids is an online resource of Clicker grids that others have made to share. There are quite a few activities here to check out. I am pretty excited to try these lessons out with my students tomorrow. I will write another review or two as I experiment more. Years ago I had a wonderful student who typed using Morse Code with a single head switch. 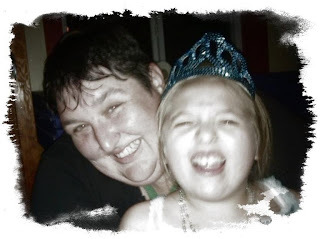 Her multiple disabilities included profound blindness spastic quadriplegia, but she was able to tap out code to do assignments like spelling sentences and book reports. She still writes e-mails and uses this method for computer access. She used Discover:Kenx and Discover:Screen on an Macintosh Power Book, some of the software she used included Co:Writer, Write:Outloud, JAWS and Scan and Calc. Later we tried to switch her to the Darci USB, but she ended up sticking with her Discover set-up. I don't know who taught her Morse Code, she came to me already knowing it, although she occasionally forgot the code for the semi-colon. I have often wondered why this access method is not taught more; it could work so well for so many. In that light, Darci is offering a free program to aid in teaching Morse Code to those with disabilities. Morse Code has a number of useful applications in special education/assistive technology, no the least of which is literacy. If the goal is literacy for all, morse code as an assistive technology tool helps us reach that goal. Use of semantic oriented AAC (Minspeak, Unity) and computer input increases speed of AAC but not literacy (in fact, in my experience, it impedes literacy). Morse code improves speed and literacy. Most code users can reach 30 wpm, with even the most limited users reaching at least 10-15 words per minute, expert users can use Morse code at up to 99 words per minute. This can be dramatically faster than scanning, head or mouth stick. Add the assistance of word prediction and macros and this can increase dramatically. 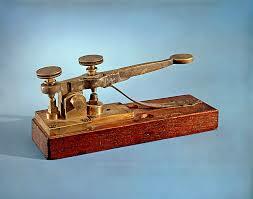 In fact, in test after test Morse Code is faster than typing on a handheld. Morse code users can create unique AAC messages, which is something that can only truly be done by those who can spell, using Morse code or some other spelling method. The pre-requisites to Morse Code for access are ability to hit a switch with control for a length of time or two switches without that timing control, ability to count to five, emergent literacy/spelling skills. You do not need to be able to see or hear, you do not need to be able to control a mouse or mouse emulator, you don't even need head control. Watch a video of a user entering input with Morse Code. Please comment if you know of a resource I missed. Back in February I wrote about a new headrest for when nothing else works. The i2i Headrest, from Stealth Products, was well worth the wait. My student who is using loves it, her mom loves it, the OT loves it, the SLP loves it, the PT loves it, the paraprofessionals love it and I love it. It is an i2i love affair. She has the i2i with the (washable) fleece cover, which we then cover with (pink and purple) fuzzy socks to keep clean. Since using it she is eating a bit better, able to use her AAC device without one of use holding her in mid-line to prevent her head from getting caught under the headrest and is no longer needing a bus monitor immediately next to her to hold her in position during travel. We have even noticed less dislodging of her hearing aids with this headrest versus her previous headrest. The only aspect of the i2i that has taken a little getting used to is the "flip down" manner in which you move the system out of the way to do transfers and positioning. You have to be ready to support the users head and get into position to lift the user the second you flip down the headrest. Once you get used to this procedure it is second nature in preparing a transfer. I had a training with our sales rep/trainer from Dynavox today and I had an e-mail from DJ at Great Talking Box about the Touchspeak hand held. So I have lots to share. First the Dynavox, we were training on the DV4, but also had a chance to take another look at the Dynavox V. I learned a couple tricks I didn't know, for example there is an assessment feature on the DV4 series (and the V series) that allows teachers and therapists to assess and train the access, language and cognition parts of using the device. During the Dynavox training Lori (our rep) gave me a copy of some of the new Dynavox advertisement material. At first I couldn't figure out why she was giving it to me, then I realized that I am quoted (via this blog) on the flyer. Very cool. My colleagues think I should get kick-backs. We also heard today about the new Dynavox Palm Top (photo above) due out in June. All I have to say about this is "Hallelujah! ", the ChatPC 3 is a total pain in the rear end (on the software end, not the hardware end) and the ChatPC 2 is no longer being sold (it was pretty decent on the software side, but not the hardware side). If Dynavox has taken their skill and talent for creating innovative, consumer focused AAC software and applied it to the same hardware as the Chat PC 3 it should be an excellent device. I can't wait to see it in action. Now we have another reason to count down until June, besides summer vacation. As I mentioned I also heard news about the TouchSpeak today. I had e-mailed DJ on behalf of a speech therapist friend looking for some ideas for a client. DJ let me know that the device will run on the HTC Dopod phone, which has a five inch screen and 5 1/8" wide by 3 3/4" high by 5/8" thick for dimensions. He will send me the weigh, the price, and the rental price tomorrow. It should be ready for rentals in June. Velcro is most likely the most versatile and commonly used tool in Special Education. We use it to mount switches, attach picture symbols to objects, to secure splints and braces, to hang posters and more. A recent thread on the RESNA listserv has been where to get Velcro on the cheap. Here is what they came up with. Here is a slide show I made to use as part of a health unit on abuse prevention. It is geared mostly towards adolescents with multiple special needs, especially communication disorders. You can download it from Slide Share. Although most of us make our own communication boards for our students and use either off-the-shelf display materials or specialty display materials for them; there are commercial, pre-made communication boards available. These boards sometimes have advantages we cannot create using our classroom resources, such as a keyguard, extra durability or being waterproof. 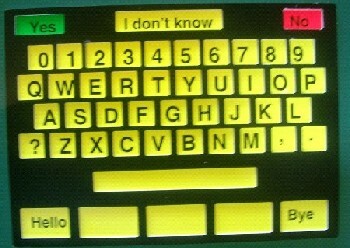 Most of the commercial board available are alphabet/text based or designed for medical use. EMAT (left) and Candle (right) both offer spelling boards with build in keyguards, the Candleboard is safe to use in water. The Buddy Board is perhaps the most unique of the commercially available boards. It is a clear plastic case that clips shut and holds a communication board inside. 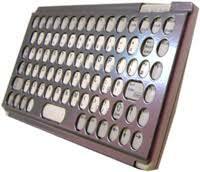 The case has a built in keyguard for a spelling keyboard or use with picture boards. The buddy board cases come in two sizes, Sr. and Jr. The overlays (underlays?) come in a variety of fdesigns including QWERTY keyboard, medical, a sticker board which includes a Mayer-Johnson PCS stickers, a blank board set and the Pro set which comes with the Boardmaker Software. You can also just buy the Buddy Board cases alone. Satillo offers the WordPower OnBoard for literate communicators to use as a primary or back-up system. It features a spelling section, 100 high frequency words, numbers, and phrases all color coded. ACCI is another company offering pre-made communication boards. They sell three different kinds: adult, child and design your own. These boards as much less medically oriented than those immediately above. All three boards have a QWERTY keyboard printed on the back for spelling. Likewise Language Images offers picture based communication boards. Several companies make communication boards that can be used to indicate pain, wants and needs for patients in hospitals, rehabs and nursing homes. These can also be very useful for our students to communicate those same needs to school staff, their doctors and nurses, family and other caretakers. In fact if our students who have high medical needs learn to carry and communicate with such boards they will be at a communicative advantage if and when they need to communicate in a medical situation. Interactive Therapy offers a series of Critical Communicators (above) for use in medical situations. Among the choices are board for the emergency room/ICU, a kid's board and a maternity board. They also offer text and very simple line drawing books. Similarly Vidatak has a set of heavy duty laminated communication boards for hospitals that they call the EZ Board. (These boards were on the TV show ER.) The board has a pain chart with a diagram of a body to point to what hurts and on the reverse a spelling and communication books. The boards come in upwards of a dozen languages. Trademark Medical offers an equivilant design on a clipboard or heavy duty laminated card called "The Silent Speaker". The Silent Speaker Boards come in three designs, one for home care, another bilingual board for acute care situations and a final large symbol board for use with children, individuals with learning disabilities and/or confusion and memory loss. Another link to check out is Indoff Hospital Boards. Indoff creates custom dry erase communication boards for hospitals and others. I've seen the teaching hands clock around before and I thought I would highlight it here today. The teaching hands clock has a unique (patent-pending) design that cues students to look at the correct hour and minutes. In particular it is useful for learners who consistently give the wrong hour between :30 and :00 (which is the error I certainly have seen most as far as time telling). It is costs about thirty dollars from A Different Road to Learning, Autism Shop or the links below. The clock is also available with a magnetic teaching kit for $40.00 about from Silverlining Multi Media and Nasco School Supplies. The teaching kit alone is about $20.00. This might be a great item to add to your end-of-the-year purchase orders. Looking for some new music for your class, but out of money? Below are links to free music! A number of research studies have verified what new-age folks believed all along, that music set to a slow tempo, specifically about 60 beats per minute, calms people and animals. This calming effect decreases anxiety and increases learning, concentration and healing. It seems the human body will relax into such a musical rhythm, slowing its biorhythms to match the music. Knowing this there is a movement to use 60 beat per minute music in different settings such as hospitals, rehabilitation unit (especially for TBI), and special education classrooms. Incompetech has free music, some of which has a listed tempo of between 40-65 bpm. There are also free tools available to measure beat per minute from Shareware Connection and Konfabulator (Yahoo Widgets). 60 beat per minute music may be just the think to slow everyone down during the end of the year wildness. Chances are as a teacher in this field that you have a classroom or program nurse. I want to publicly acknowledge my wonderful classroom nurse, Nancy, for a job well done and unlimited dedication to our students. Every classroom should have a nurse as great as she is. Thank you, Nancy! At this time of year, as we prepare our students for the transitions that the end of the school year inevitably brings, we may be turning our attention to the best ways to pass on information about our students to the next teacher. In particular, we may be worried about our students safety and the risk of skill regression if the proper information does not reach the proper people. In that light you might want to check out the Call Centre's information on Communication Passports. I have spent quite a bit of the evening creating personalized placemats for my students to take to summer camp or school after the last day of school next month. The download of the Power Point placemat tutorial with the template was great for making a lot of placemats in a short time. Tomorrow I will print and laminate them and add them to the boxes that will be sent off to my students' extended year programs. Next, I will fiddle with some of the other Communication Passport Resources and the ideas for Lifestyle Plans from Essential Lifestyle Planning. ICTS in the UK has a full page of crib sheets ready for download that provided tutorials about common software programs used in the intensive special needs classroom. Learning A-Z, a series of websites for teachers, which are normally accessed by paid subscription only, are hosting a series of online open houses this coming week for teacher appreciation week. Velcro Brand Picture Paper is photograph paper for your inkjet printer that already has Velcro (the hook side) on the back. It will stick to Velcro receptive materials! Imagine printing your picture symbols on this and not having to gunk up your scissors with cutting the squares of Velcro and not spending all that time sticking on the Velcro to the backs of the symbols. Mayer-Johnson and similar companies sell it for $10.00 for a 12 sheet pack, but you can find it online and in some local office or photography supply stores for less than nine dollars a dozen. Hopefully you already are using the "soft stays" mnemonic to remember to out the soft (loop) side of the Velcro on the wall, in the communication notebook or on the device and the hard (hook) side on the items that "move", e.g. the symbols. ASL Pro is a free website that has video clips demonstrating more than 10,000 words and phrases. We keep it loaded up on one of the computers near where we do symbol recognition and sight word work with our hearing impaired student. I have also started learning a sign a day from the dictionary in order to improve my ASL vocabulary. In fact, I find this site to be so beneficial that I wrote to the site owners and thanked them. Mother's Day (in the USA) is the second Sunday in May (in 2007 May 13th). I have always found doing mother's day activities to be a bit dicey in the classroom. Especially since I usually have at least one child whose mother has passed away, left or who is adopted and has a birth mother/mom dilemma. (On a personal level) I have always found it insulting when someone implies that making a mother's day card for your sister or aunt or whoever is just as good as making one for your mother; the person who says that invariably has a mother to give a card/gift to and doesn't know what it is like not to have a mother to give something to. That being said this year I happen to have a class that has no mother's day issues and plan to do a mother's day activity with them. In case your situation is such that you want to plan a mother's day activity here are some links to set you on your way. Yesterday, working with my classroom speech therapist, we set out to find a keyguard for our student's Dynavox DV4. We need a new keyguard because we are switching her to a different number of buttons on each page. Mostly my internet search was to get a price, but instead I was thrilled to discover that FRS Solutions is now selling Dynavox DV4 and MT4 keyguards that are inset and flush with the screen ($150.00). This will solve one of our chief problems with this student and her DV4, that of her fingers getting stuck between the (old) keyguard and the screen. Long story short: I put in a purchase order for the FRS DV4 Keyguard this afternoon. Since I can't be the only one with a need for keyguards on communication devices and computer input technology I thought I would post about companies that make or sell keyguards. The first place to check for availability of keyguards is the vendor of the device or keyboard, i.e. Prentke-Romich carries keyguards for all of its AAC devices. Next check out the popular assistive technology vendors in your area, this is especially true for keyguards made for standard keyboards, Alphasmart devices and Intellikeys. and Turning Point Technology (USA) carries an array of readily available keyguards, plus quite a few special Intellikeys keyguards for certain children's software. They also have a trial rental program. See here for an introductory article about keyguards.